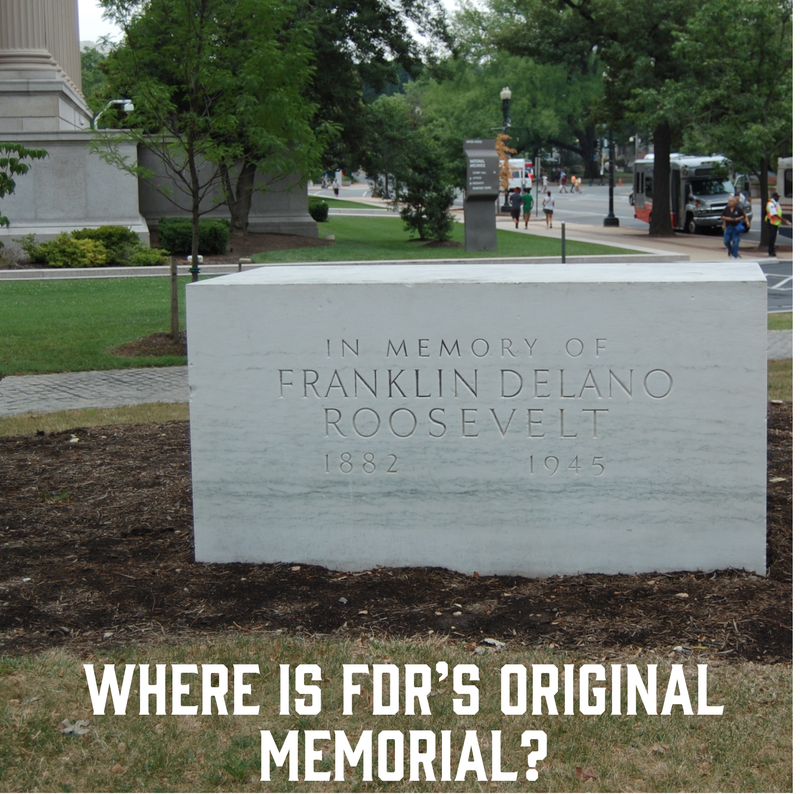 Where is FDR’s original memorial? Franklin Delano Roosevelt was the only president elected four times (1932, 1936, 1940, and 1944). Sadly, he passed away from a cerebral hemorrhage shortly after being elected to his fourth term. Leading the country through an economic crisis and a world war usually puts Franklin Roosevelt near the top of most greatest presidents lists. No matter how one views Franklin Roosevelt’s time in the White House, his legacy has a permanent place in our nation’s capital in the form of a memorial. Dedicated in 1997, the Franklin Delano Roosevelt Memorial in Washington, D.C. is far from a modest remembrance of an oft-admired president. At seven and a half acres, it is the largest presidential memorial on the National Mall. In many ways, the FDR Memorial is one of the most powerful and captivating memorials on the Mall. Its power lies in its grandeur. 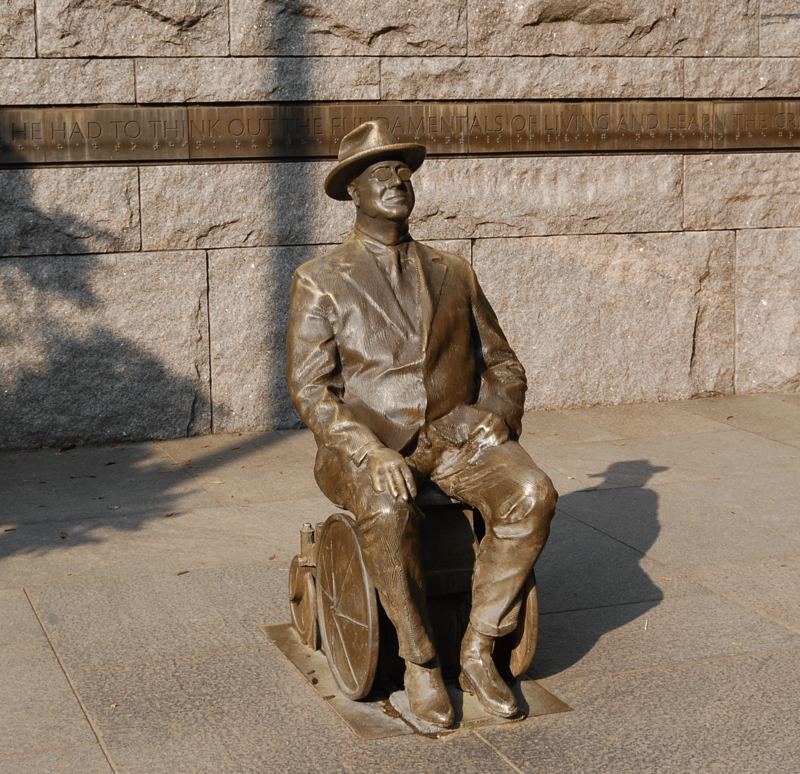 Upon arrival to the FDR Memorial, the visitor is greeted by a solitary bronze statue of Roosevelt seated in his wheelchair, a stark reminder of the president’s personal struggle with polio. Then, the visitor travels through four main sections, each representing one of FDR’s four terms. The memorial’s pink granite, cascading waterfalls, bronze statues, and inspirational quotes tell the story not only of a president, but also of a nation. 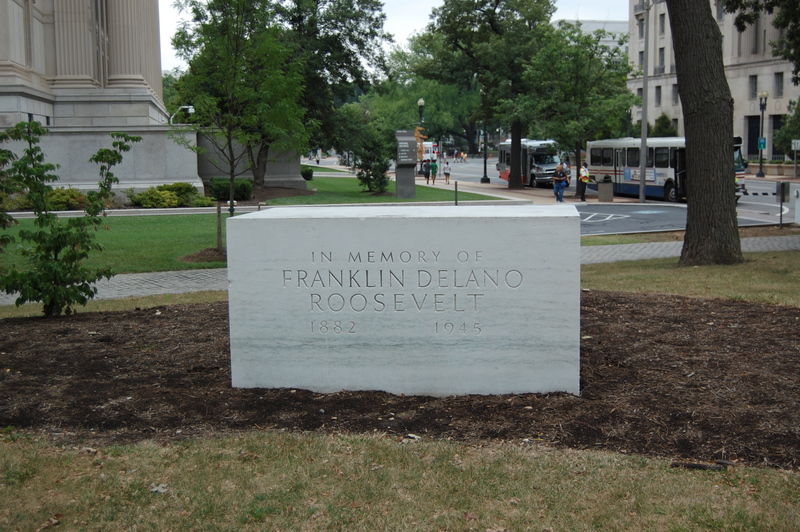 But, technically-speaking, this is not the first memorial in our nation’s capital to honor FDR. Even more, the FDR Memorial might go against the wishes of Roosevelt himself. Despite the beauty and magnitude of the FDR Memorial, Roosevelt spoke of a much more modest memorial. How should FDR be remembered? It’s interesting to consider how we remember our presidents. Massive memorials are constructed to honor the memory of admired presidents: Washington, Jefferson, Lincoln. These architectural accomplishments craft a narrative of a president’s legacy. 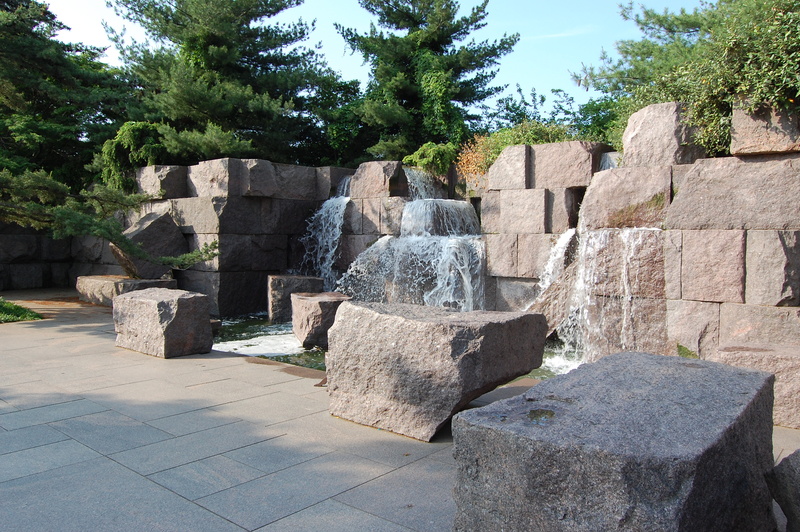 The FDR Memorial is an expansive tribute to a significant president. Nevertheless, the question remains: How should FDR be remembered? 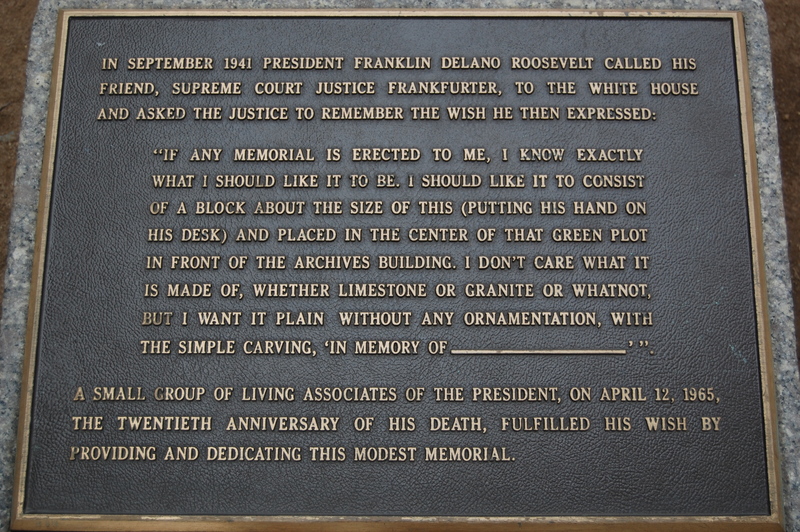 If one takes FDR at his own words, the President wanted a small, modest memorial. Perhaps the fact that FDR thought of the construction of his own memorial points to another interesting question: Can a president accurately envision his own memorial? In any case, the original, desk-sized memorial located by the National Archives is a fascinating contrast to the seven football fields of granite that sprawl along the Tidal Basin. $100,000 bill: Which presidents are on our money? Previous Post What is written on Thomas Jefferson’s gravestone?